Who would have thought that bananas and rhubarb combine for such amazing flavour? This is one of those simple recipes that you probably already have every one of the ingredients in your kitchen! 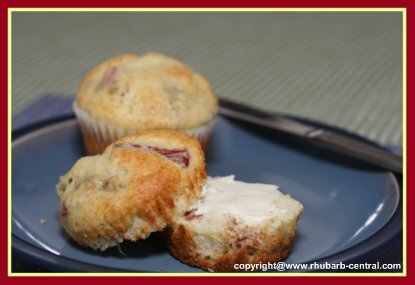 Be sure to read the review (scroll to bottom) that website visitor Sara sent in after she made a batch of these muffins! Look at the photos...these muffins have "eye appeal too"! 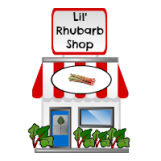 You can use fresh or frozen rhubarb for this recipe. If you use frozen rhubarb, thaw it in a colander before baking, and discard the extra liquid. 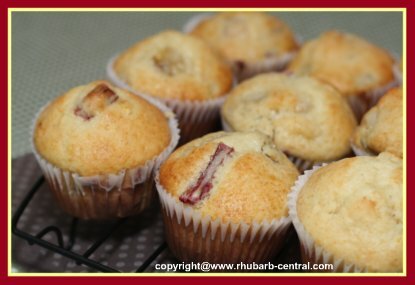 YUMMY Rhubarb and Banana Muffins! Stir in the milk, vegetable oil, and the mashed banana, and set aside. In a larger bowl, combine the flour, sugar, baking powder, salt and nutmeg. Add the egg mixture to the dry mixture stirring just to combine, (the batter will be lumpy). Add the rhubarb, just to combine, do not over-mix. Fill prepared muffin cups (greased or papered), about 3/4 full of batter. Bake at 400° F for about 22 minutes or until a toothpick inserted in the middle comes out clean. Note - I put the oven setting on "broil" for the last minute to darken the tops of the muffins. For another delicious recipe that uses both rhubarb and bananas, try Rhubarb Banana Pie ! 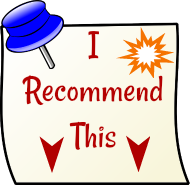 "...Just wanted to let you know that your recipe for banana rhubarb muffins is excellent. It was easy to follow with ingredients I had on hand. The muffin cups were very full but the muffins did not overflow. They baked up beautifully with golden brown tops, no broiling required. And the taste is excellent. I can't stand banana flavored foods so I was surprised how tasty these are. Thank you for the great recipe." 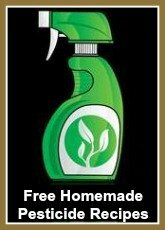 Thank YOU Sara for sharing your recipe success! To speed up the ripening process of unripe bananas, simply place a ripe tomato or a ripe apple inside a paper bag, along with the unripe bananas. Close the bag, and leave it at room temperature overnight. Bananas should be ripe by the next day!